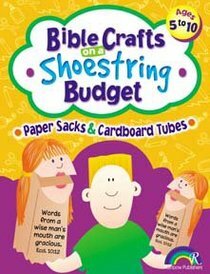 - Publisher Stretch your church's budget by using paper sacks and cardboard tubes to teach the Bible. Each crafts includes an interactive Bible lesson, step-by-step instructions and reproducible patterns. For ages 5-10. 96 pages. About "Paper Sacks & Cardboard Tubes (Reproducible, Ages 5-10) (Bible Crafts On A Shoestring Budget Series)"
Stretch your church's budget by using paper sacks and cardboard tubes to teach the Bible. Each crafts includes an interactive Bible lesson, step-by-step instructions and reproducible patterns. For ages 5-10. 96 pages.